Over the past few years the buoyant but sometimes fickle demand of craft beer drinkers has forced brewers to keep up with an ever-changing and innovative market. With an increasing number of Canadian breweries opening each year, craft beer drinkers have an abundance of local and global brands to choose from. So what does it take to stand out and stay relevant in your customer's mind? — Eli Gershkovitch, CEO, Steamworks Brewing Co.
One man who knows how to stay relevant is Eli Gershkovitch. Vancouver local and CEO of Steamworks Brewing Co. and Owner of Steamworks Brew Pub in Gastown and full production brewery in Burnaby. Eli has positioned Steamworks as a household name among British Columbian beer drinkers. He and his team have been delighting Steamworks fans with creative flavors and quality craft beer since 1995. So what does it take to build a serious craft brewery? It all began in the mid 90’s on the cobbled streets of Gastown, Vancouver. Eli was passionate about elevating the local craft beer industry, and during his search found what is now Steamworks Brewpub: the first steam-powered microbrewery in Canada. Steamworks has been crafting unique brews ever since. “Steam really works at Steamworks,” says Eli. The brewpub has a rare steam heat system renowned for producing exclusive flavors and award-winning brews. Eli also believes there was great congruity between the historical nature of Gastown, the exposed brick and post beam construction, and the nature of craft brewing. From the opening day of Sunday, July 16th, 1995, Steamworks has been fascinating beer aficionados alike with “in your face brewing!”. This fresh and interactive approach to brewing has paved the way for Steamworks to provide a complete craft beer experience, to bring the public alongside its process and to support a growing industry. Eli explains that nowadays, it’s much more about consumers' palates. They are drinking beer to treat their taste buds and are trying a plethora of unique variations in beer types and styles offered by clever breweries across BC. For beer fanatics, there’s plenty of room to be picky. Steamworks continues to impress beer drinkers, holding true to their cutting-edge, original character by crafting brews that are a little bit out there. Steamworks offers 15 beer varieties year-round, as well as seasonal and time-honored favorites that keep their loyal fans wanting more. Their newest bottle-conditioned release, Sanctuary, is running off the shelves. This collaboration with Blasted Church Winery is a (7.5% abv) Saison brewed with the addition of Gewürztraminer grape must. You can separate a Steamworks bottle from the rest with only a quick look at its label! This is a perfect example of branding done right. Now, while I know the Art Director behind the packaging, it is clear that the steampunked illustrative style, combining steam-powered machinery with historical settings, strikes a chord with a large audience, extending way beyond British Columbia. 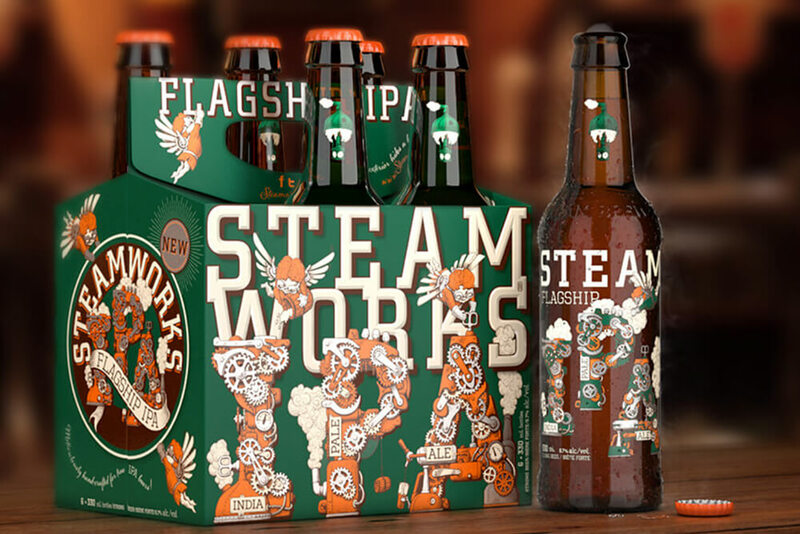 Steamworks’ Flagship IPA, for example, pushes branding boundaries and tells the story behind the brand. The letters I, P and A are illustrated as if steampunked machines are operated by beer cherubs, effectively brewing the Indian Pale Ale. The iconic brand logo is on every material. An interpretation of the local Gastown steam clock powering a copper brew kettle highlights Steamworks historical roots, as well as a sense of place. “The concept for going “steampunked” all started from a doodle that Laurie shared at a meeting… Truly, it was the inspiration for everything that followed,” says Eli. In fact, some fans love it so much that they are even getting it tattooed! Beyond just the beers, Steamworks also offers a range of offbeat collectible merchandise, from wearables to glassware and craft beer accessories. These products keep brand lovers loyal. Steamworks continues to head the new wave of craft beer marketing, securing their name as a long-term brand. “Over the next 20 years, we will work to solidify Steamworks' position so we can become one of those brands that stand the test of time” explains Eli. Stay true to the idea of craft beer: brew interesting and flavorful beer. Be consistent and dependable. Creative and purveyor of quality. While it’s pretty clear the risks he took paid off, like Steamworks’ expansion from a brewpub to a production brewery in 2013, Eli recognizes that new challenges ensued, such as more marketing, distribution and packing costs. Once the production facility was fully up and running, Steamworks increased sales from Vancouver to international markets across Europe and the United States. Eli explains that mastering logistical challenges and cultural sensitivities are paramount when tackling the complexities of overseas markets. Photo: Steamworks Facebook page and packshots by Outshinery. Building a beer empire takes time. For Eli, Steamworks' brewery has developed over twenty-three glorious years. To become a leader in the industry, not only should you brew a delicious product, but also develop iconic branding and a solid business! These strategies Eli has dialed. With lots of flavors and styles Eli and the team still want to explore, they will continue to do what they strive for every day: push the envelope, get better at the craft and have fun doing it! Are you starting your own brewery or already have beer on the shelves? Why not do like Steamworks and use Outshinery for all your imagery needs? Get perfectly consistent packshots (bottle, can, 6-pack and more) before your beer is even finalized. Claim your free test shot below to test the magic for yourself! If you’re not quite ready for this, make sure to follow Outshinery and Steamworks Instagram feeds to keep your finger on the pulse!